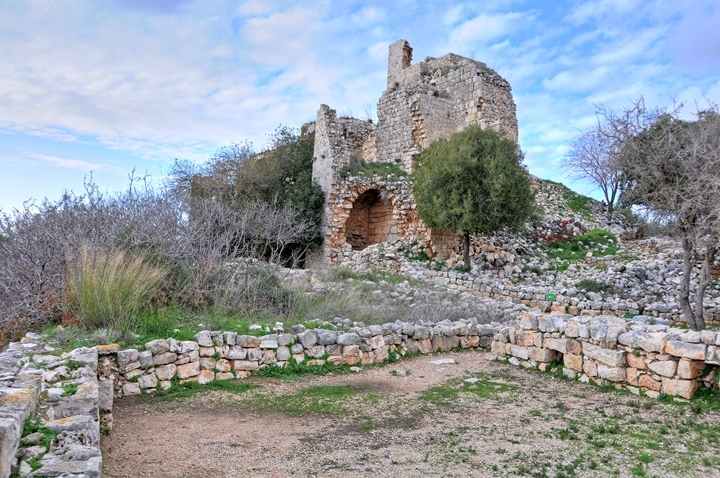 Ruins of a Crusader and Ottoman period hilltop fortress in the Upper Western Galilee near Kibbutz Yehi'am. 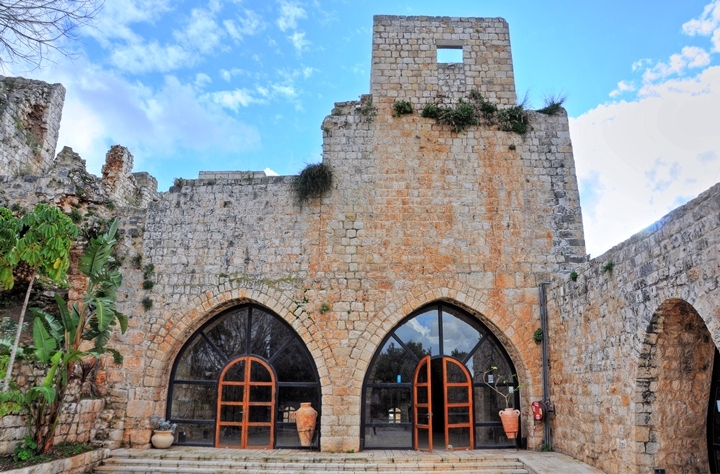 The hilltop castle in the Upper Western Galilee started as a fortified farmhouse, then rebuilt by the Teutonic Knights in 1208. It was destroyed after 60 years by the Mamelukes. 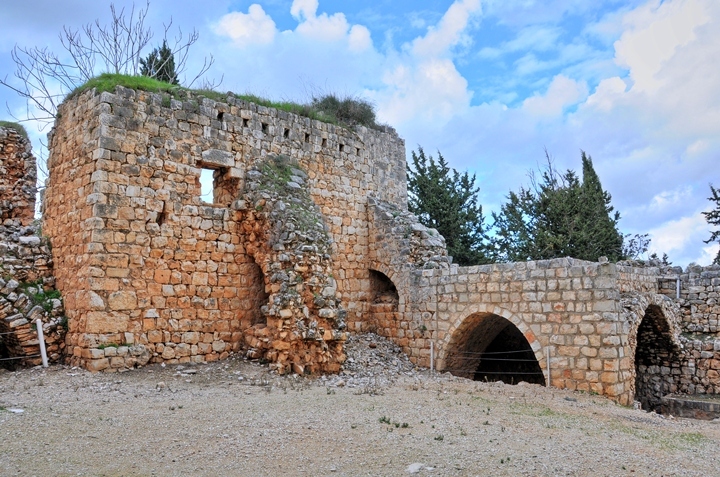 The ruined fortress was rebuilt by Daher el-Omar in the 1760s. In 1946 the Kibbutz of Yehi'am was established here. 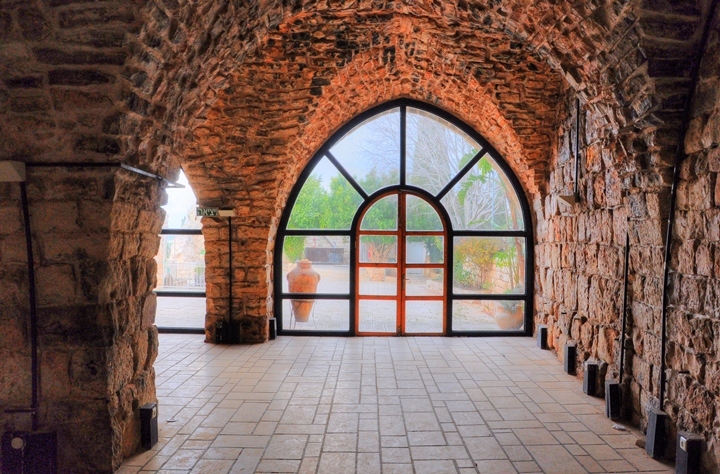 The fortress is located on the south east side of Kibbutz Yehi'am, at a height of 405m above sea level. 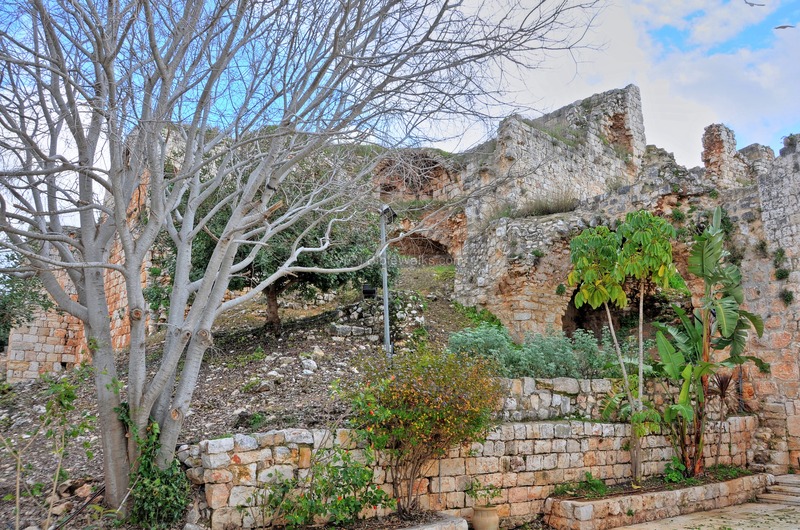 Its greatest natural defense is on the south side, as the fortress is 125m above the valley. The visitor center is on the south east side of the Kibbutz, reached through its main street. The fortress was built on the ruins of a Roman and Byzantine period settlement. A Byzantine burial cave can be seen in the entrance to the fortress. The Crusaders arrived from Europe to the Holy Land in order to liberate the Holy Land and free Jerusalem. 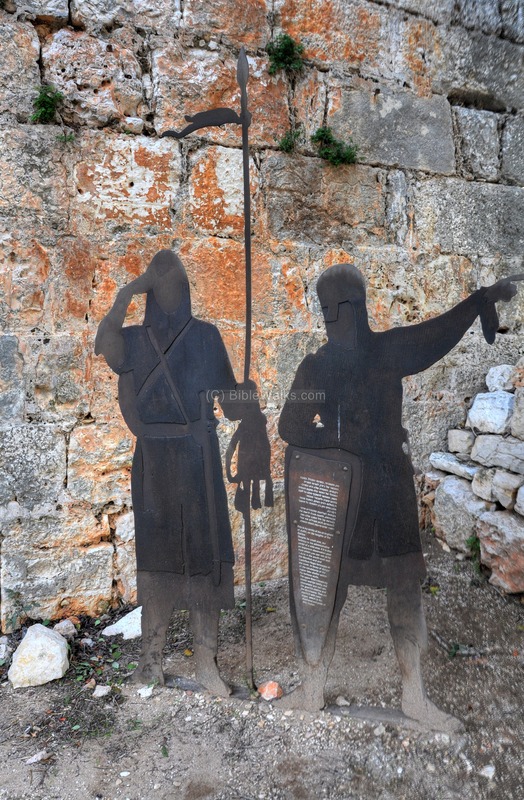 They accomplished the mission in 1099, and established the Crusader Kingdom. Although the Crusaders were confronted by their enemies in many battles, the Kingdom held for 88 years. 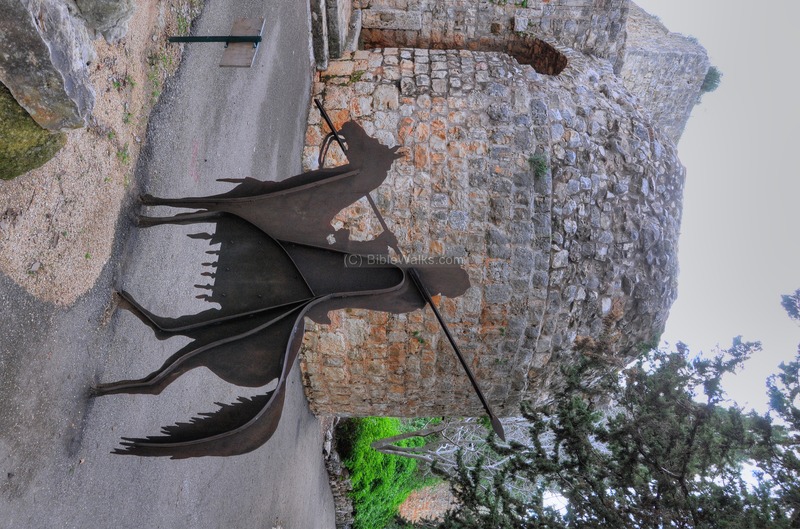 Within a few months after the defeat of the Crusaders at the Horns of Hittim (July 4, 1187), the Crusaders' presence in the Holy Land ended. A third Crusade was launched in 1189 in order to reclaim the Holy Land and Jerusalem, and by 1192 the Crusades reestablished the Kingdom in the Galilee and a narrow strip along the coast. 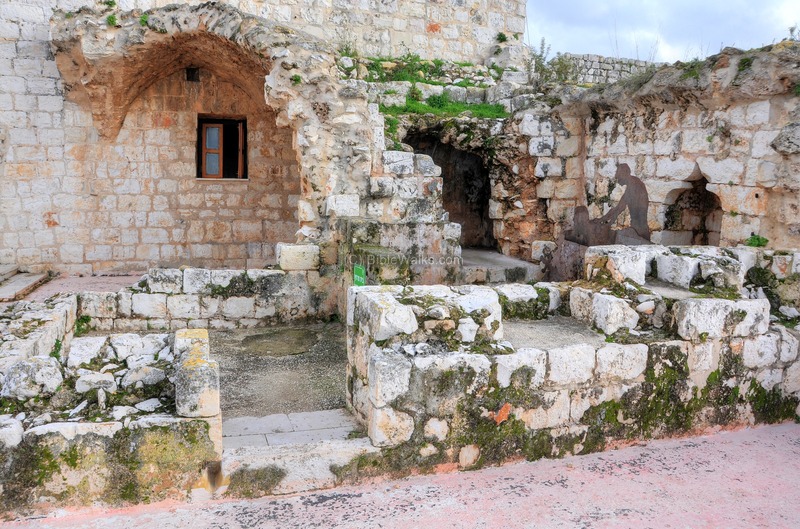 The capital of the Kingdom was in the Galilee port city of Acre, while Jerusalem was recaptured only in 1229. 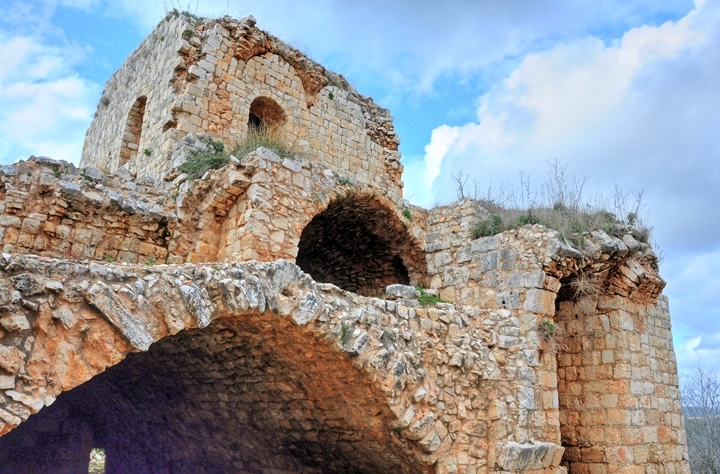 Along the borders of the Kingdom the Crusaders built fortresses. The land was divided among land owners who constructed fortified farms. One of the fortified farms was built on top of a hill overlooking the valley of Nahal Yehi'am. The tower on the east side of the complex was built during this time. The fortified farm was sold in 1208 to the German Teutons, Crusaders that came from Germany in the 13th Century AD and established the "Order of Brothers of the German House of Saint Mary in Jerusalem", or in short: the Teutonic order. 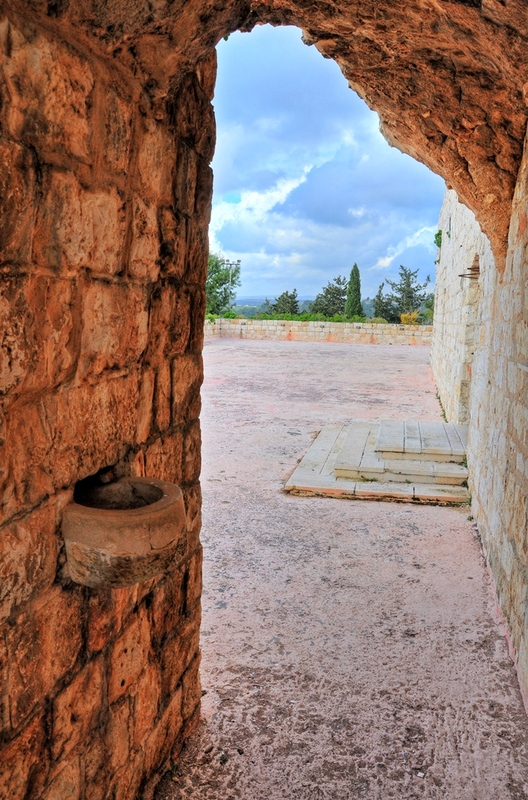 This order was formed in Acre in 1192 based on a mission to manage a field hospital, like the Hospitallers order. They were then transformed to a military order in 1198. 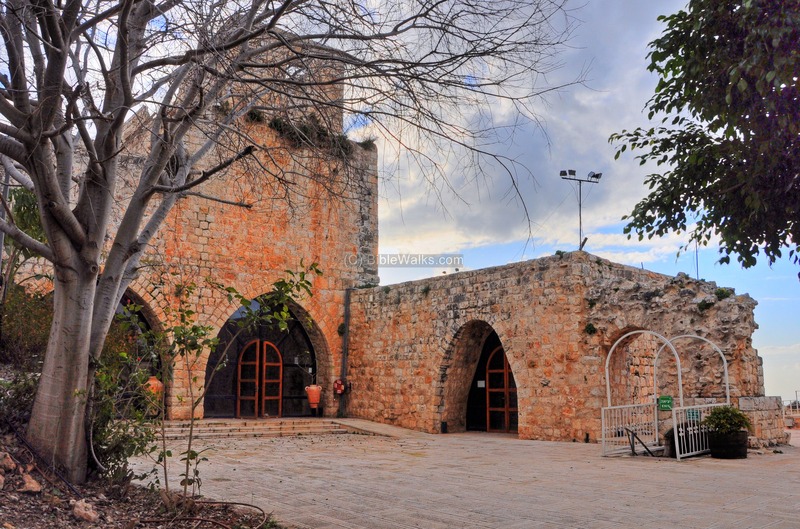 The order was the largest landlord in the Western Galilee, and their center was the Montfort fortress until its fall in 1271. Their center continued in Acre until the fall of the city in 1291, then the Teutonic order spread out to Europe. 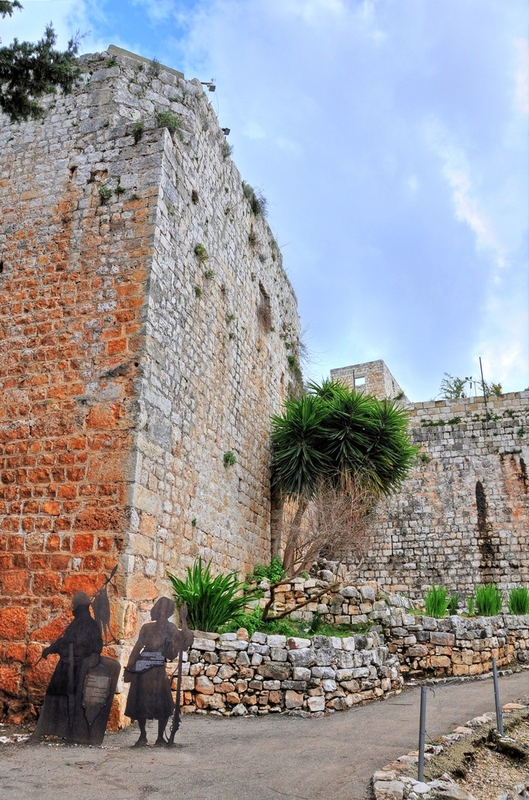 The Teutonic Knights strengthened the fortress in Yehi'am, and named it Judin. 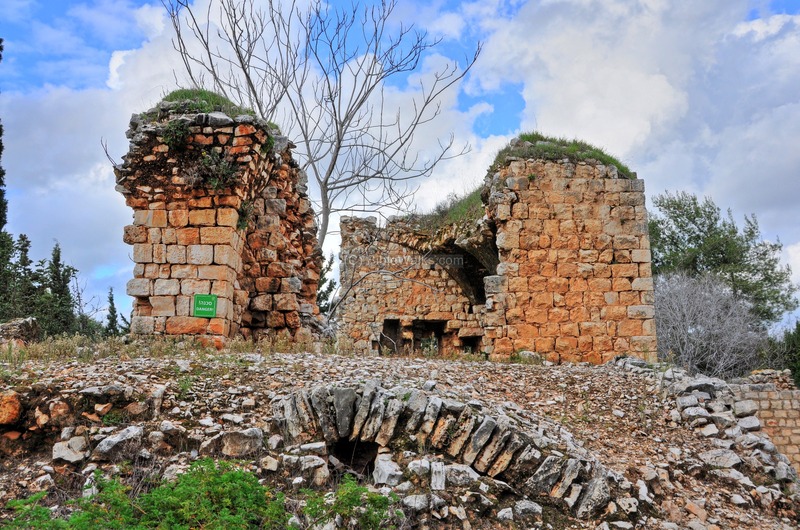 They also owned the nearby fortresses in Mi'ilya ("King's fortress - Castellum Regis) and Montfort ("Kings new castle" - Casatellum Nouwn Regis ). These fortifications were planned to defend the capital Acre from the east side. The fortress of Judin consisted of two great rectangular towers, with the eastern tower probably being the earliest. The towers were enclosed by high curtain-walls - a common medieval fortification design of defensive walls around the towers. This castle was designed according to German castle plans, such as found in the 12th Century Münzenberg castle, which also had two high defensive towers. The high tower is based on a structure known as Bergfried, similar to the Keep or Donjon in English and French medieval castles. Another feature of the Teutonic castles is the remote, rough and inaccessible location of the castle. The strength of the castle could not withstand the enemy assaults. 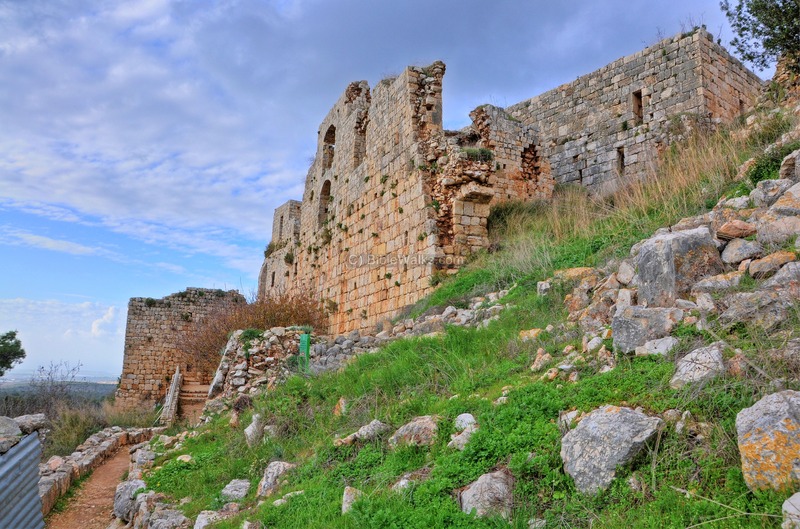 In 1268-1271 the fortress was captured and ruined by the Mamlukes, and it remained in ruins for about 500 years. 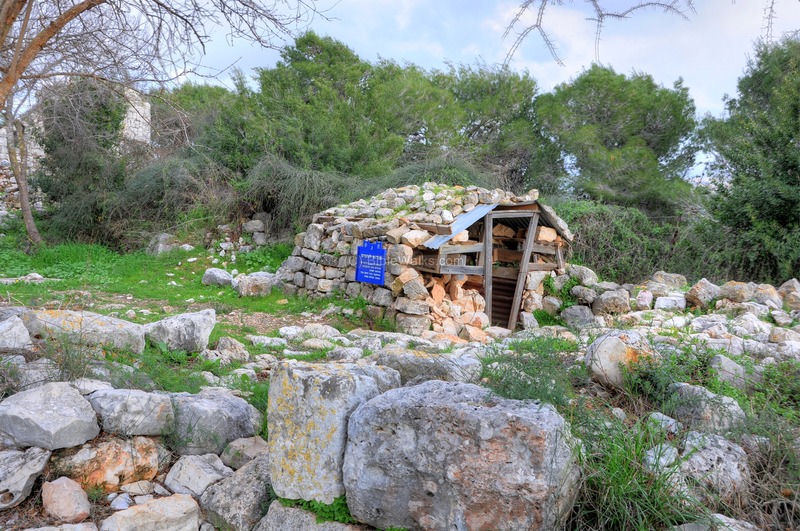 In the 18th Century a Bedouin named Daher el-Omar mutinied against the Ottoman empire, capturing the area of the Galilee and establishing a self governed province in the years 1730-1775. Daher and his family fundamentally reshaped the Galilee landscape by building fortresses, warehouses, khans and administrative buildings. 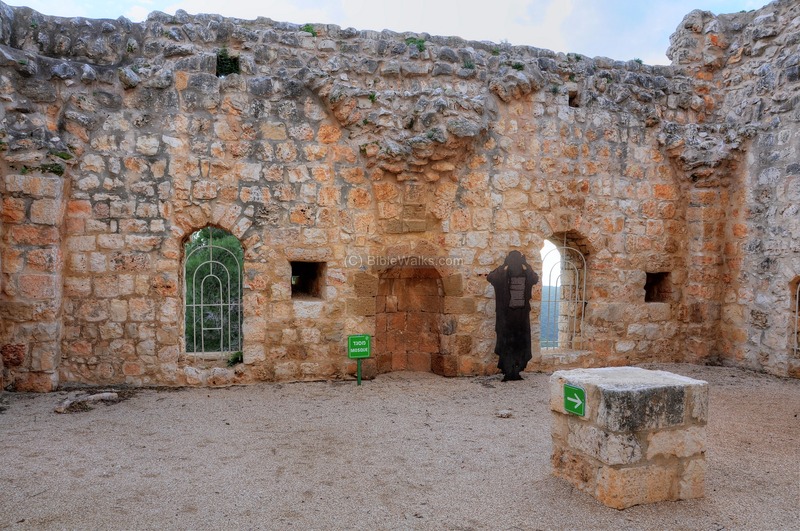 Daher was born in the Galilean village of Arraba in 1690, son of a rich Sunni Muslim family from Tiberias. He first conquered and fortified the town of Tiberias on the shores of the Sea of Galilee (1730). 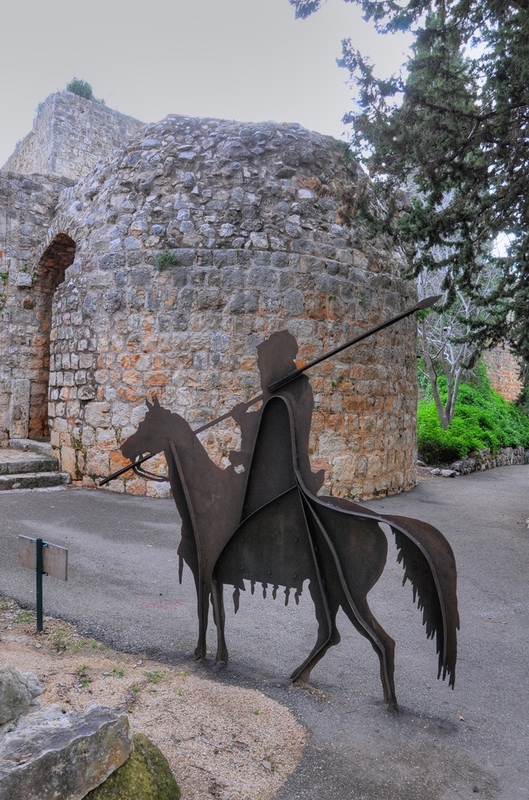 He refortified a number of ruined Crusader fortresses, including Jiddin (Judin). Daher captured this fortress in 1738 from its owner, Ahmad al-Hussein, following a battle near the fortress. After successfully withstanding a siege of the Ottoman army from Damascus in Tiberias (1742), he conquered Shefaram (1742), fortified it and later moved his headquarters to this western Galilee town. After capturing Acre (1746) he refortified it (1750). In 1757 Daher expanded to the south west by capturing and fortifying the port towns of Haifa and Tantura (Dor), in order to expand the export of cotton and olive oil to Europe, which was the main source of income of the Galilee. In 1771 he captured the port city of Jaffa. This was the peak of his territory, extending from Sidon (captured a year earlier) to Jaffa. The Ottomans finally decided to put an end to his domain, and following a massive naval bombardment of Acre (1775), Daher was killed during an attempted escape from the city. 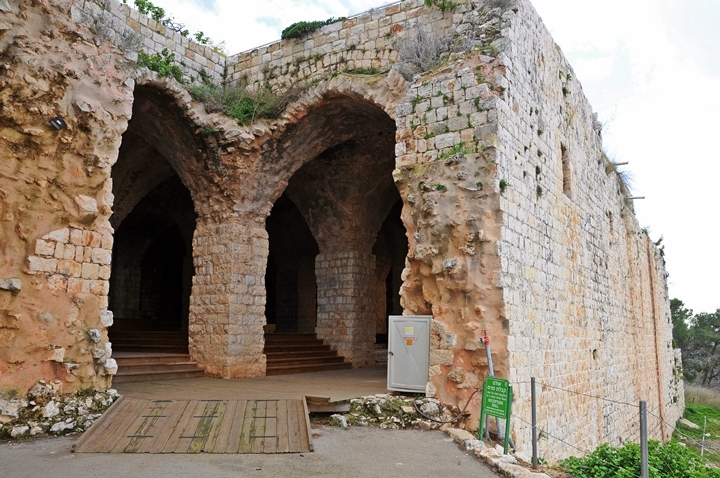 His son Ali held the fortress until 1776, but then the governor of Acre captured the fortress. The fortress was used in 1834 as a safe haven during the Peasants revolt of 1834. Muhammad Ali of Egypt, the Ottoman commander and later the ruler of the Ottoman Egypt, bombarded the fortress in order to quell the mutiny. Conder and Kitchener surveyed this area during the Survey of Western Palestine (SWP) in 1873, commissioned by the Palestine Exploration Fund (PEF). A section of map sheet 3 appears below. "Kul'at Jiddin is mentioned by Marino Sanuto in 1322 as a castle of the Knights of the Teutonic Order, situated on Mount Saron. It is shown on his map in correct relative position to Chateau du Roi (M'alia) and Montfort (Kul'at el Kurein). The fortress was restored by Dhahr el 'Amr in the middle of the eighteenth century. A Saracenic castle, built by Dhaher el 'Amr during his rebellion against the Turkish power. Some parts of the castle are still in a fair state of repair, though now it is entirely deserted and is rapidly falling to pieces. It shows some good Saracenic masonry, and was protected by a wall defended by round towers at some little distance from the keep, on the east side. A photograph in the Palestine Exploration Fund new series shows the general characteristics of the building. There are a good many rock-cut cisterns and a rock-cut birket round the castle. This castle is mentioned by the Monk Bouchard ('Descriptio Terræ Sanctæ, c. iv. ) as the Castellium Judin, about four leagues from Acre. He says that it formerly belonged to the Teutonic Order, but was in his time destroyed. hollowed in the rock are found beneath a paved court. Below and near the castle a second enclosure, flanked by semicircular towers, contains within it the remains of numerous demolished houses and cisterns.' ". 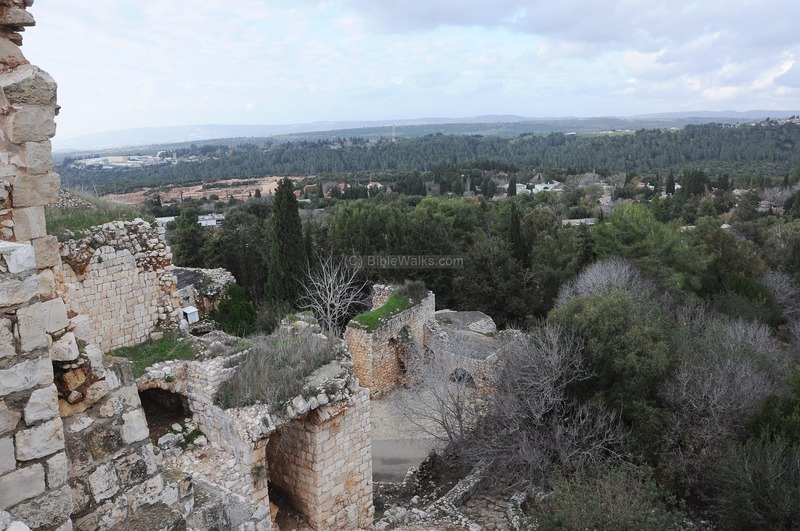 In 1946 a Kibbutz was established near the fortress after purchasing the lands in the area. The members first settled in the ruins of the fortress, then relocated to the area west of the fortress. 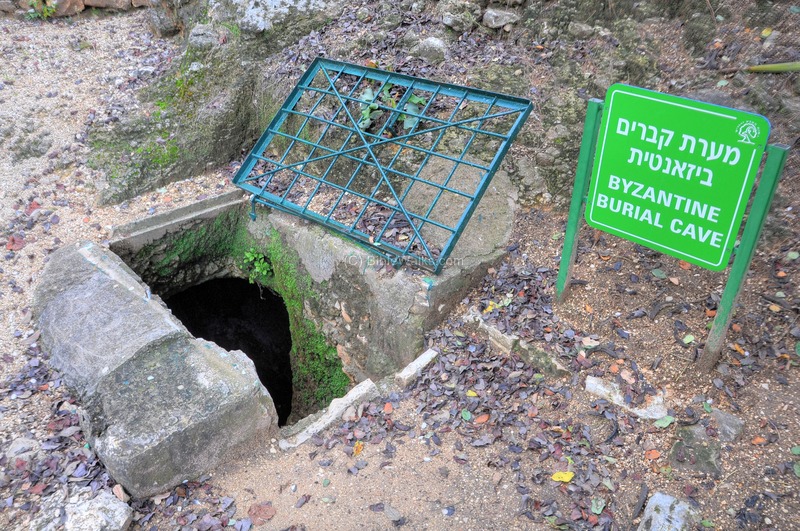 They named their settlement in honor of Yehiam Weitz, one of the 14 Palmach soldiers who fell in the attack (June 17, 1946) on the Achziv railway bridge, part of a nation wide attacks on bridges during the British Mandate. 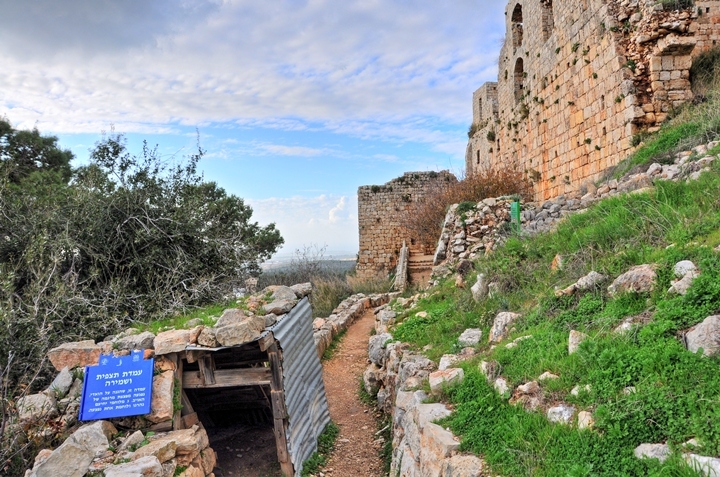 During the independence war the settlers used the fortress to defend themselves, building defensive walls and posts. In March 27, 1948, a convoy bringing reinforcement and re-supply to the Kibbutz defenders was attacked near Cabri, with 47 Haganah members dead. The fortress is a national park. Its ruins were cleared and the site was prepared for viewing by the public. Art festivals are occasionally held here. 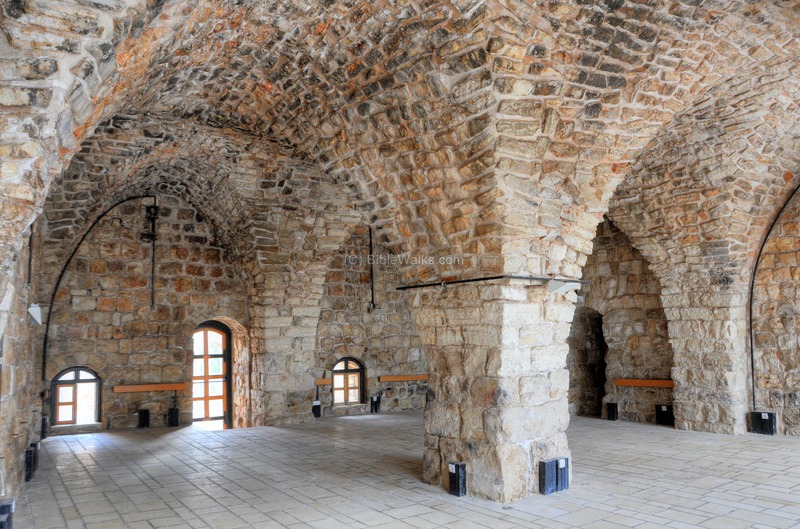 At the end of the summer time, during the Sukkoth holiday, the park service conducts a Renaissance festival in the fortress. As you can witness from the sample photos in the remainder of this page, the site is highly recommended! 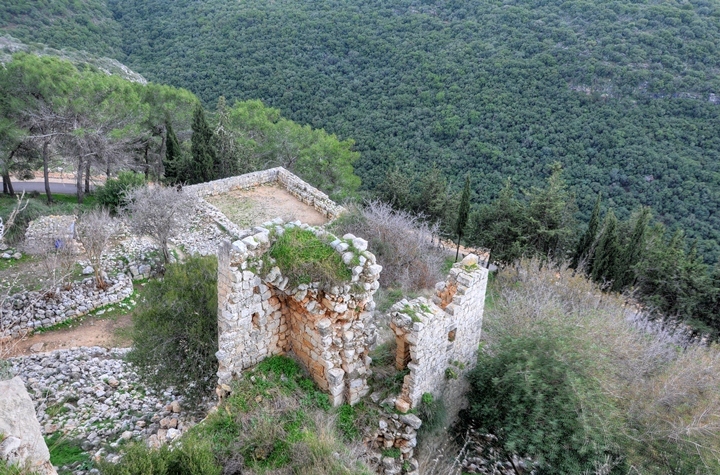 A drone captured this view of the ruined fortress from the west side. 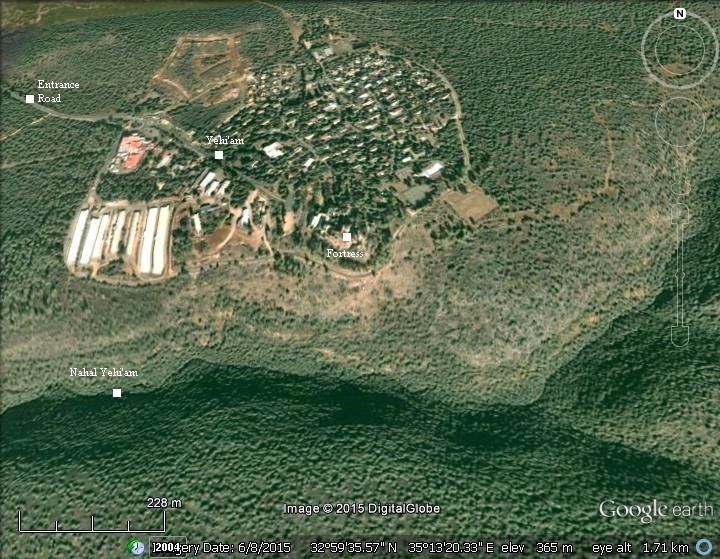 Notice the steep valley of Nahal Yehi'am on the south (right) side. A lower view of the fortress is in the next photo. 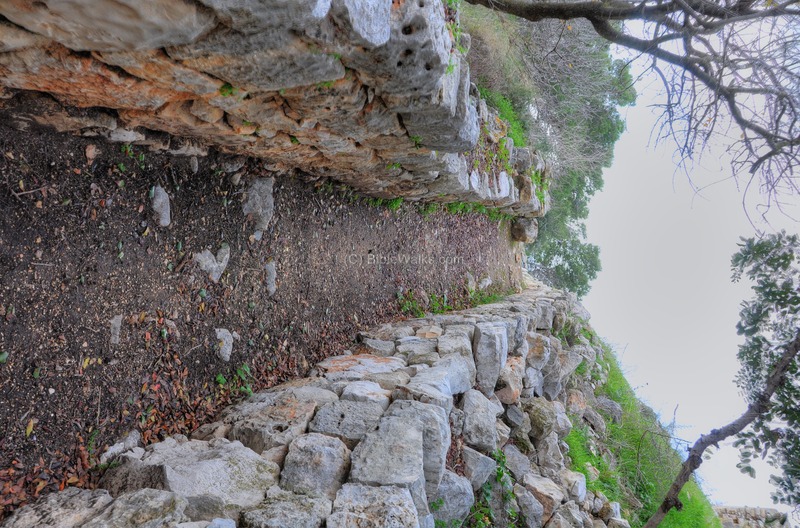 After passing the national park entrance, the path leads up to the north side of the fortress. On the right is a view of the fortress from the west side, with the park entrance to the fortress marked with a yellow square. The photo below shows the northern side of the fortress, as seen from the access path. 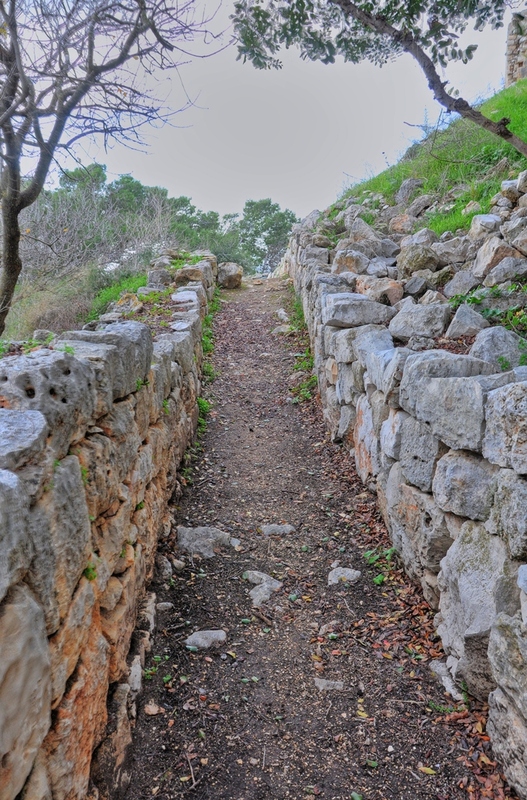 A section of the northern wall is seen along the entrance path. Steel statues of Crusader knights were installed across the park to simulate the Crusaders times. There is also text written on them that explain their function. The wall is composed of a lower level dated to the Crusaders period (larger stones), and the upper level dated to the 18th century. 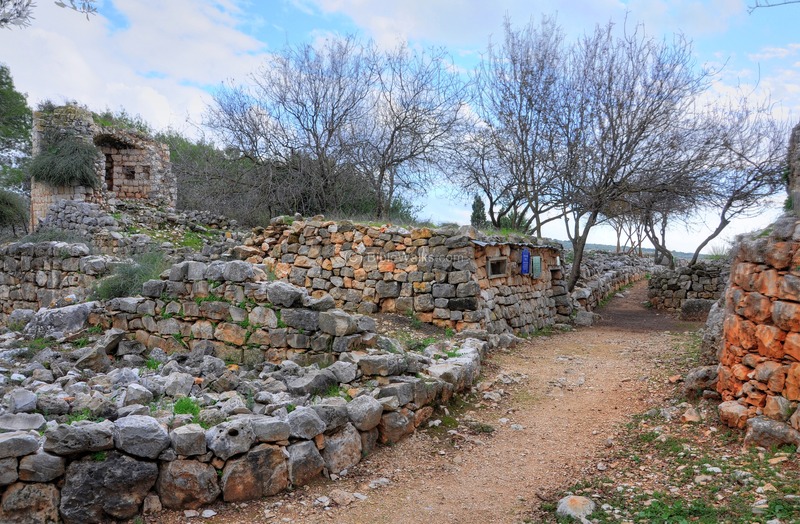 On the side of the path are remains of the Byzantine period which predated the construction of the Crusaders fortified farm. Additional findings and structures dated to the Byzantine period are located on the east side. 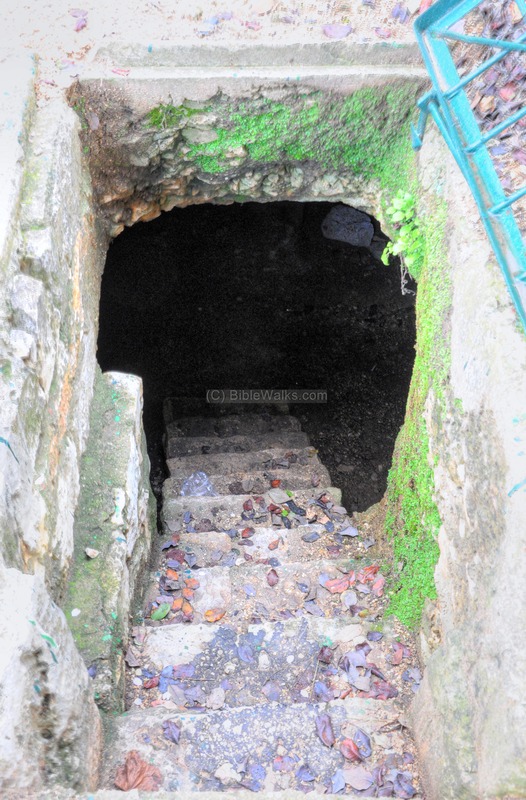 Steps lead down to the burial cave. Remains of the Crusaders and Ottoman period walls are located along the path and in various sections of the complex. Many sections have not yet been excavated and await future archaeological work and conservations. Daher el Omar added a west wing above the hillside. 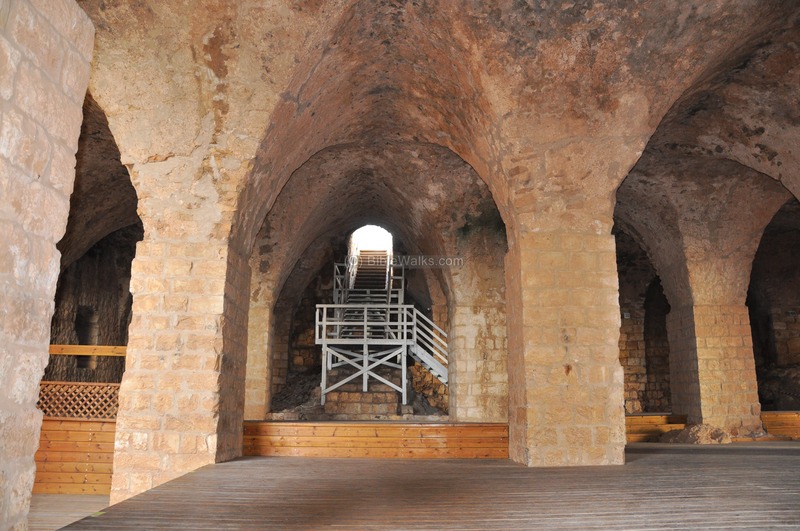 The three storey building included a large vaulted hall on the lower level, a bathhouse and mosque on the second level, and a third level with a residential house and tower. 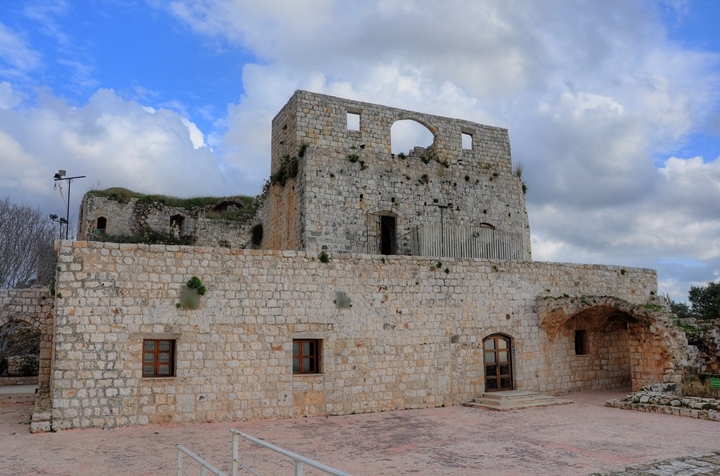 On the right is a view of the fortress from the west side, with the three storey building seen on the closer side. The entrance to the halls is marked with a yellow square. The photo below shows the entrance to the halls on the north west side. 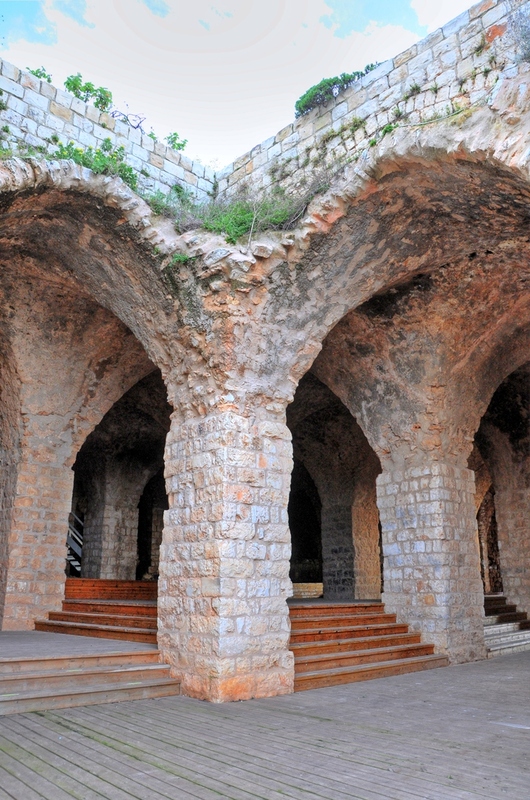 The vaulted halls were the basement of the residential quarters of Qal'at Jiddin - the fortress of Judin. 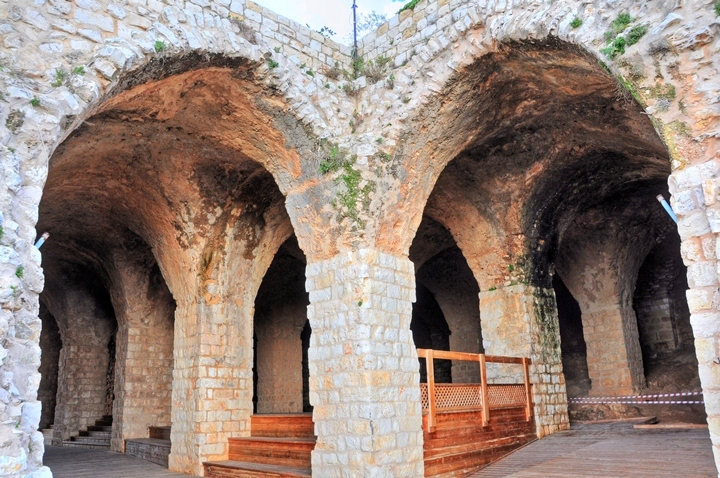 The roof above the halls rest on 15 square pillars, and are supported by the arches. The National Park authority and the IAA performed a conservation project of this beautiful colonnaded hall. The second storey above the vaulted halls included a mosque on the south side and a bathhouse on the west side. In this photo is the entrance to the mosque on the left. Another view of the entrance to the mosque is in the following photo. Above this building is the third level of the 18th Century castle. The interior of the vaulted hall is seen below. It was probably the residential quarters of the governor of the castle. This hall is used today as a restaurant and center of events that are occasionally held here. The next photo is a view towards the entrance. The reconstruction of this 18th Century building is remarkable. A view of the building from the west terrace is seen in the next photo. Notice that above this level is a third third storey, with residential rooms and a tower. To the east of the west wing are remains of the central section of the fortress. 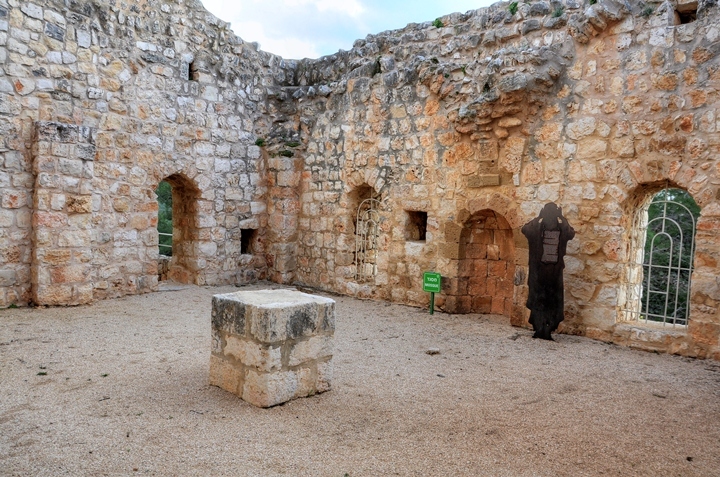 This was also a third storey building, first built in the 13th Century by the Teutonic knights, and later repaired in the 18th Century by Daher el-Omar. 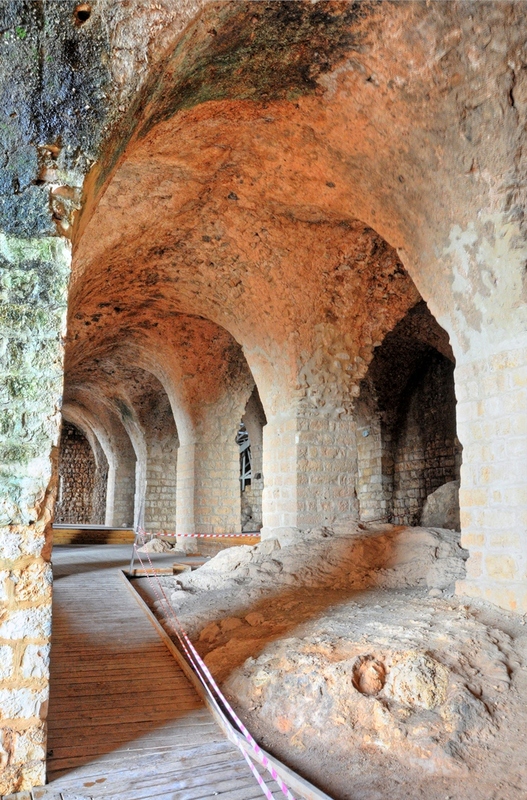 A bath house, dated to the 18th Century, is located above the vaulted halls on the west side. It is marked with a yellow square on the right. Below, the view of the ruins of the bathhouse. It was probably a private bathhouse used by the governor and his family. 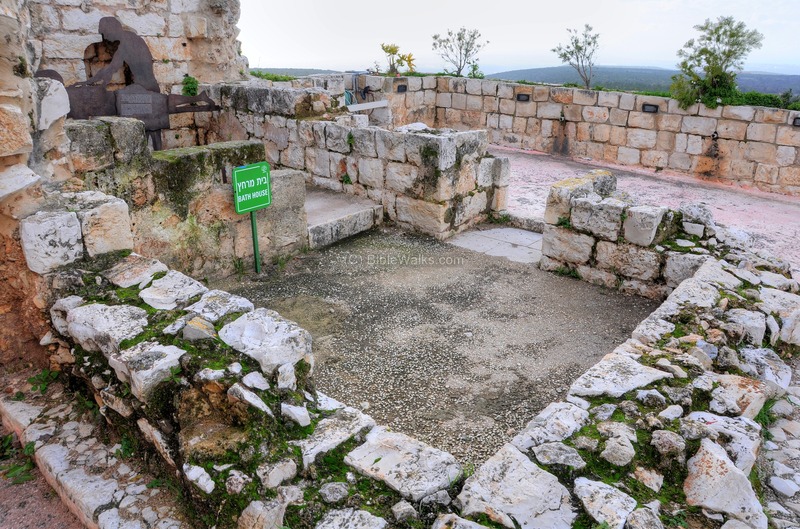 Another bathhouse may have been located in the central tower. The water was warmed by a wood stove, heating the bath water in one room and filling another room with steam. The water for the bathhouse was fetched by jars from the cistern, then poured into the tunnel. A mosque is located behind the bathhouse, on the south side of the second storey. It is marked with a yellow square on the right. The Islam prayer niche (Mihrab), here on the left side of the black statue, faces the south (in the direction of the Kabaa in Mecca, as in all mosques). 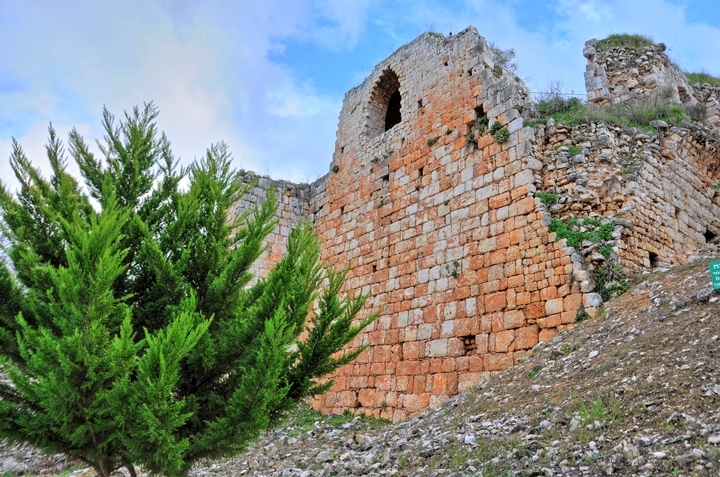 Remains of the Crusader and Ottoman period walls are seen on the south side of the fortress. They are marked with a yellow square on the right. 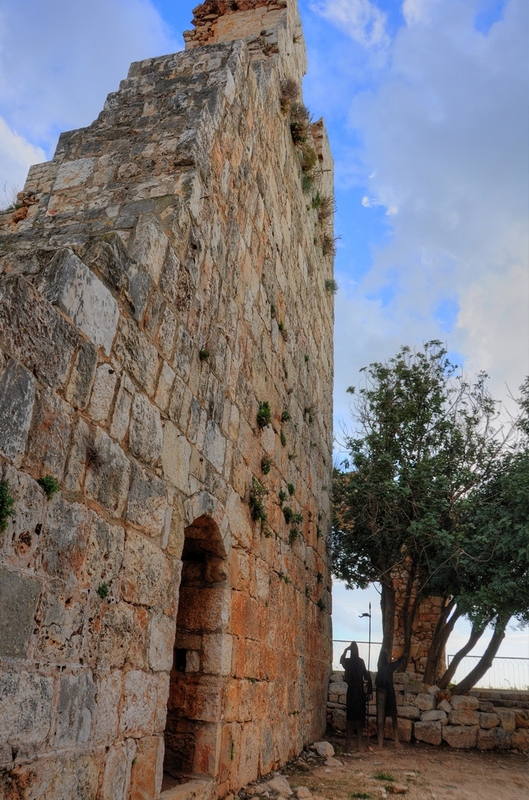 The lower side of the southern wall is made of larger stones, dated to the Crusader period. The upper level was built during the 18th century. Embedded in the south wall is a white marble stone, which is a reuse of a Roman/Byzantine stone belonging to the earlier settlement, perhaps a public building or a Byzantine Church. 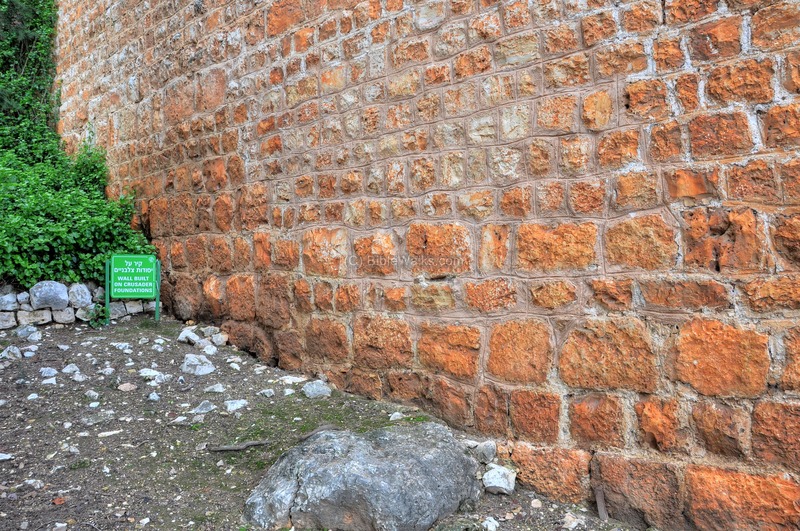 At the end of the path is an entrance to the mosque on the south west corner of the fortress. Along the south side is a defense post dated to the Independence war. In this post a mortar fire killed three soldiers and wounded one female soldier. 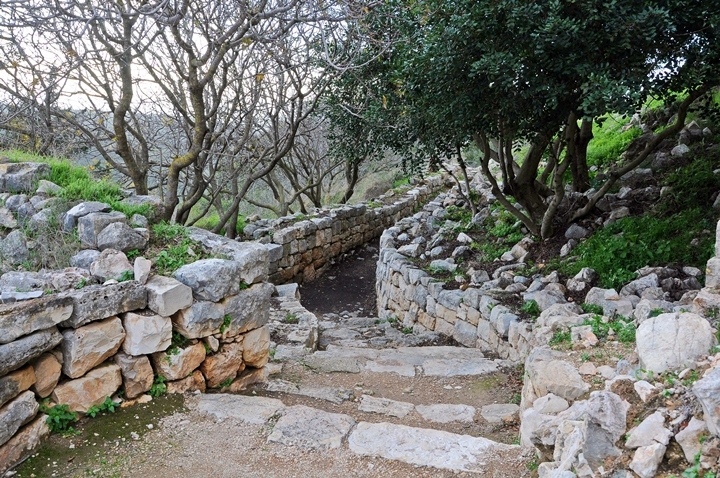 A path protected by walls connects it to other sections of the hill. 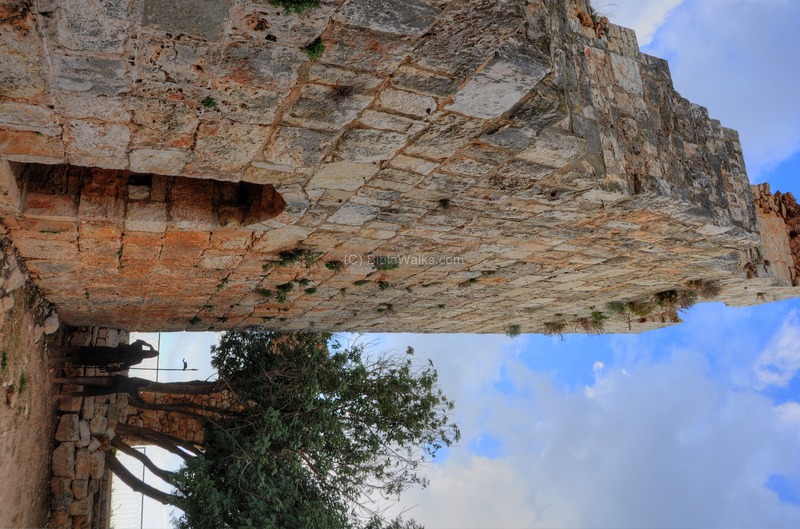 Remains of the eastern tower are seen here, dated to the Crusader period, with a later extension in the 18th century. 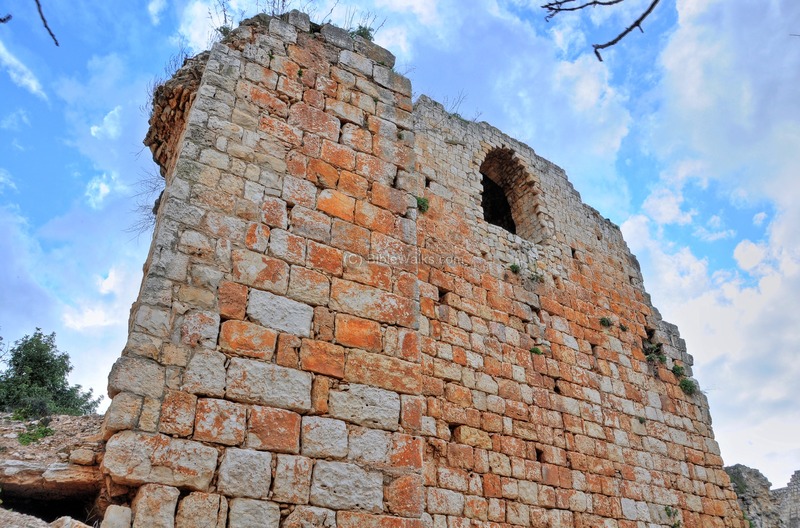 This tower is located in the center of the fortress and was probably the earliest structure. It is marked on the right with a yellow square. Above the Crusader level is an addition of the 18th Century building. Another view of the eastern tower is below. The wall is 4-5m thick and 15m high. Other remains of the Crusaders and Ottoman walls are seen here. 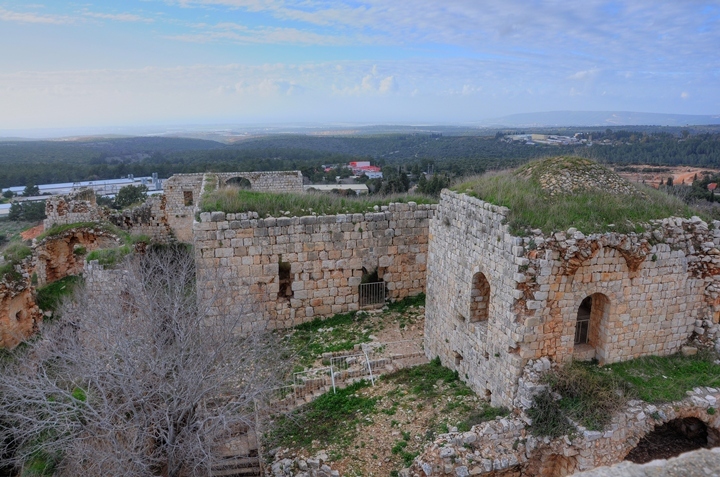 A general view of the center of the Crusader fortress, with a view towards the north, is seen in the following photo. Steps lead up between the eastern and central towers up to an observation point on its roof. This is marked with a yellow square on the right. Along the way up you can stop to enjoy the scene - a good excuse to catch breath. The view in the photo below is towards the north west, with the central tower on the left. The way up passes along sections of the tower. After reaching the observation point on the roof of the tower, you can enjoy the great views around the castle. A western view from the western tower is seen in the following photo. 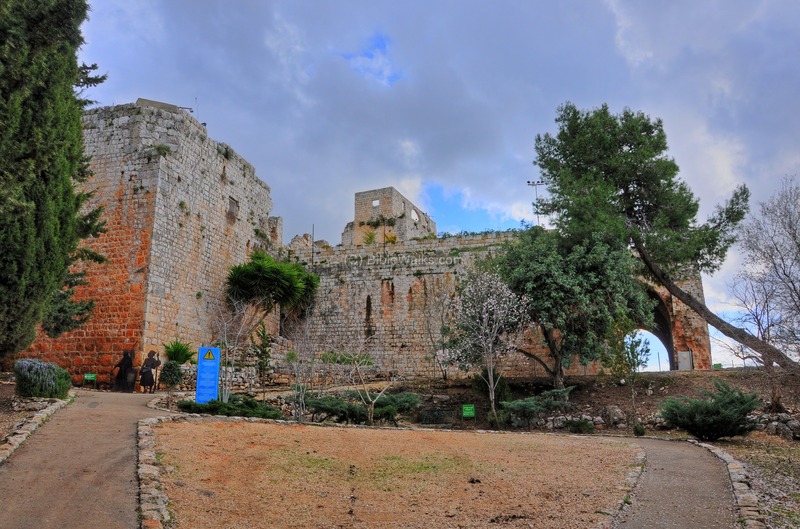 The 18th Century fortress, built by Daher el Omar on the ruins of the Crusaders castle, was entered from the north east side of the complex. It is marked with a yellow square on the right. 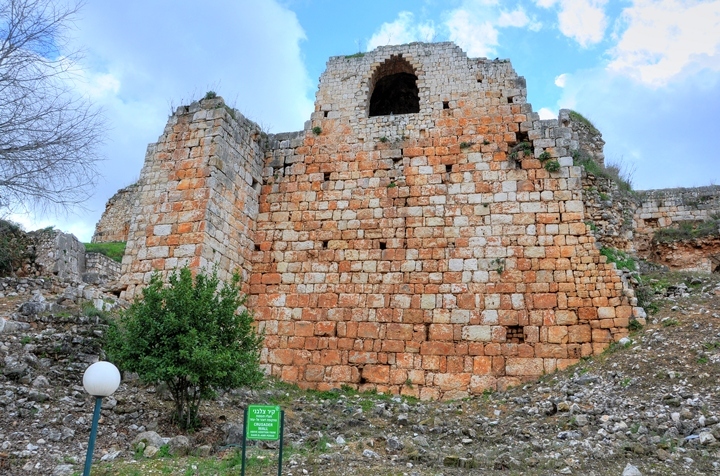 Below is the semi-circular tower which protected the entrance. The gateway was through a narrow entrance in the side of the tower, which was closed by a pair of wooden doors reinforced with iron straps. After passing into the tower, there are two more turns that are required to pass prior to arriving into the court. This plan slowed down the penetrating enemy, which is a common design in gates. Along the walls and the corridor were a number of arrow slits, such as the one seen on the left side of the entrance. The exterior side of the arrow slits are thin vertical openings. The inner side, behind the wall, has an oblique angle cut away that permitted the archer a wide field of view. On the north east side are remains of the defensive positions and walls built and used by the Kibbutz settlers during the 1948 independence war. Another battle shelter is seen in the following photo. Here one of the defenders was killed during the enemy attack. Yehi'am, Yechi'am - Hebrew: "The nation shall live". The the Kibbutz and fortress are named after Yehi'am Weitz, one of the 14 Palmach soldiers who fell in the Bridges attack in 1946. 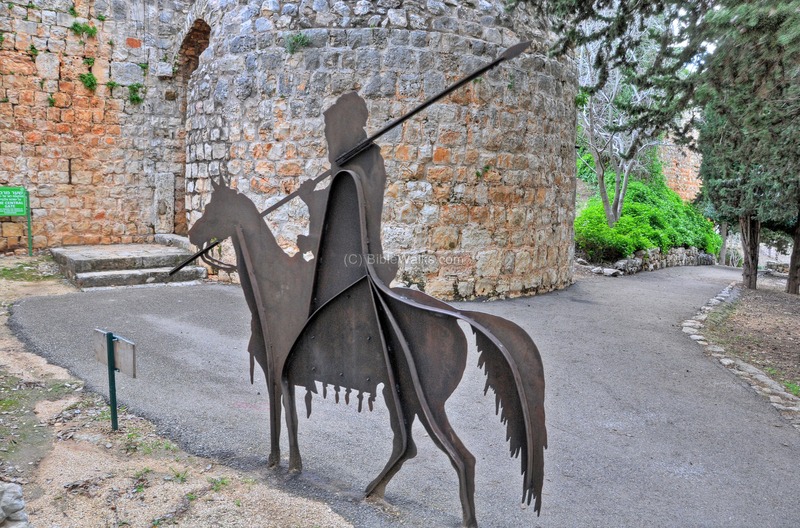 Judin - Crusader name of the fortress. Jüdin in German language means Jewess - a female Jew . Qal'at Jiddin - Arab name of the fortress. Qal'at means fortress, Juddin based on the Crusader name.